Black Panther the Breaking Wave of a New Trend? I had a bad back when Black Panther was in theaters and finally caught up with it on DVD. If you’ve not done so already, you should definitely see this film, though a few caution flags might deter you from jumping onto the critical acclaim bandwagon. 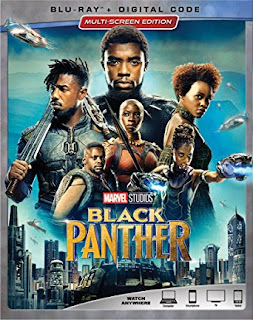 In brief, this black superhero movie postulates a hidden African empire, Wakanda, which formed when four of five warring tribes—the warrior-like Jabari are holdouts—united and agreed to share vibranium, a metal deposited by a meteorite. Vibranium has qualities that allowed Wakanda to develop a civilization and level of technology far in advance of anywhere else on earth. Our tale opens when T’Challa (Chadwick Boswick) ascends to the Wakanda throne, endures challenges, and seeks advice from Queen Mother Ramonda (Angela Bassett). Think Joseph Campbell's hero's journey cycle. T'Challa also puts up with his meddlesome sister/tech wiz Shuri (Letitia Walker), and good-natured needling from all for his obvious infatuation with his ex-lover Nakia (Lupita Nyong’o). No Marvel Comic franchise—especially one released as a summer blockbuster—is going to be a romantic comedy, so lets first address just this much of the film. It’s a very good thing to see Africans and African Americans cast as heroes and heroines instead of modern-day Stepin Fetchits or worse: pimps, whores, drug dealers, gangbangers, or goofy sidekicks to white stars. Lest anyone be tempted to label Wakanda a black fairy tale, know that the Kingdom of Greater Zimbabwe (11th-15th century) was indeed far in advance of any European society of the time. Take away Wakanda’s futuristic trappings and replace the high tech with advanced Iron Age knowledge, and a Wakanda-like civilization is historically accurate. In like fashion, the idea of a cloaked superior civilization is a common comic book and fantasy trope. Think of Wonder Woman’s Amazonia, Uganda in Ignatius Donnelly’s Caesar’s Column, Charlotte Perkins-Gilman’s Herland, Atlantis, some of the lands in Gulliver’s Travels, even Brigadoon. There are literally scores of examples found within utopian literature and science fiction. Once again, it’s refreshing to populate such worlds with black faces. Black Panther is strongest in constructing Wakanda. Director Ryan Coogler deftly and succinctly gives us just enough information about beliefs, rituals, family structure, power structures, everyday life, and challenges to bring his fictive world to life. He does so on par with the backdrop Patty Jenkins developed in Wonder Woman; Coogler's is also a world in which women have important roles. T’Challa is the Black Panther, but the film’s women are well-developed personalities with the ability to advise, assist, even humble T’Challa. The central story also intrigues. As it transpires, some very nasty folks also know about vibranium, including Ulysses Klare (Andy Serkis), who is essentially an arms dealer on steroids. He masterminds the theft of an ancient museum object whose vibranium is mislabeled as iron, and intends to sell it to the highest bidder. Obstacles in his way include T’Challa—posing as the chief of a backward African nation, the Wakanda seen by outsiders—his regimental commander Okoye (Danai Gurira), a CIA agent named Everett Ross (Martin Freeman), and Erik Stevens (Michael B. Jordan), a former agent with lots of issues, including megalomaniacal dreams of creating a global black empire the way Alexander the Great built his: by conquest. This sets the stage for the film’s central drama, but it’s also where Coogler’s imagination wanes. A film director doesn’t have to follow comic book conventions. Wonder Woman took on a look that transgressed its World War II time period, even though it anachronistically blended the past and the future. Coogler resorts more to standard cloak-and-dagger techniques as prelude to a potentially apocalyptic battle. In that struggle, he too liberally borrows from what has already been done. Just change a few costumes and props, and you’ve seen these battles in Lord of the Rings, Game of Thrones, Star Trek, and Star Wars, especially the last of these. When Everett Ross takes command of an advanced fighter craft he’s never piloted, he must intuit its operation and trust his instincts. He is essentially Luke Skywalker tapping into the Force. In similar fashion, the giant rhinos in Black Panther are analogous to the AT-AT Walkers of Star Wars or the wargs in Lord of the Rings. Some have criticized Martin Freeman’s role in the film, and I suppose it depends upon how you wish to spin it. You could see his presence as a sop thrown to white audiences; on the other hand, you could argue Coogler is making snide comment upon black sidekick roles by casting a white actor in that position. (Freeman is definitely not the superior intellect.) Mostly, though, the last third of Black Panther loses both the sociology and the humor that made the first two-thirds so compelling. It goes for easy thrills and hyper-sensationalism; in doing so, the film becomes ordinary instead of distinct. It is clear, though, that there is great global desire on the part of audiences to see something other than white heroes on the screen. Black Panther has already grossed more than $1.3 billion worldwide and that number is climbing daily. In this sense, Black Panther might well touch off a trend that will overwhelm any artistic shortcomings. That deserves applause. Clicking on images will open a larger picture. Williamstown’s venerable Clark Art Institute has four special exhibits on view this summer. Were they a baseball game, we’d score it two extra base hits, a single, and a whiff. 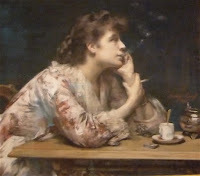 The season’s biggest show is Women Artists in Paris 1850-1900. I wish I could call it revelatory, but it’s not, and it’s neither the fault of the artists nor the show’s curators. A remark from Elizabeth Jane Bouguereau, the wife of famed academic salon painter William-Adolphe Bouguereau, sums up the problem. She painted in her husband’s style and was considered at best a copyist. 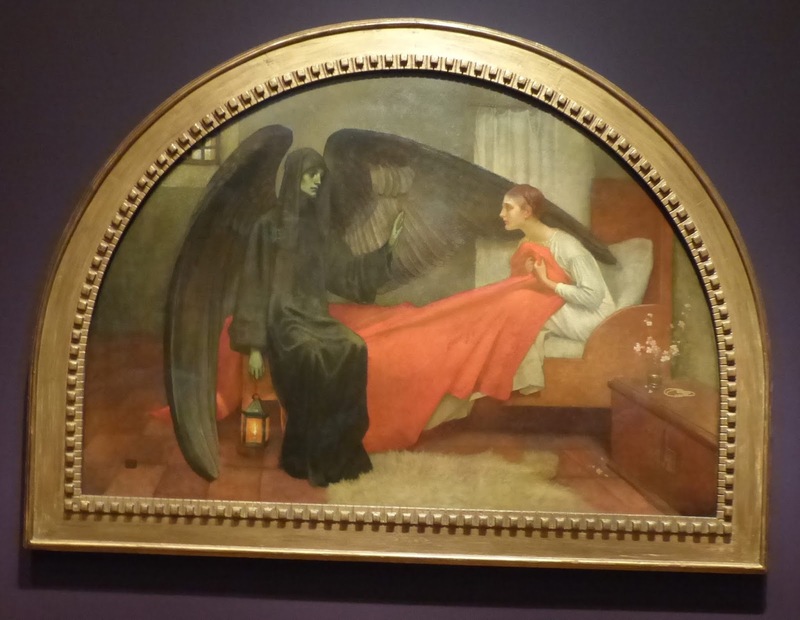 (Many critics insisted most of her works were actually done by her spouse.) Her reply was that she’d rather win renown as a fine replicator of William-Adolphe Bouguereau than be forgotten altogether. This is another way of saying that female artists of the day enjoyed the light of the French countryside, the intellectual life of Paris, and each other’s company, but social shackles limited what they could do. This means that, though the paintings on display are well executed, most of them reinforce the cult of domesticity rather than challenge it. Most French women, in particular, largely basked in the stylistic light defined by men rather than generating their own heat. In other words, whether they dabbled in impressionism, realism, portraiture, or academic painting, they had to swab colors according to male rules. After all, it wasn’t until 1865 that Rosa Bonheur became the first female artist to win Legion of Honor recognition; there was no formal association of women artists until 1881, and no woman was admitted to the School of Fine Arts in Paris until 1897. Those who obtained notice mostly did so through their associations with men. Berthe Morisot, for example, was married to Édouard Manet’s brother; Mary Cassatt’s career was aided by her friendship with Edgar Degas. As did Elizabeth Bouguereau, they also evoked male artists. Much of Morisot’s work is reminiscent of Renoir, and though Cecilia Beaux rendered white on white and black on black magnificently, her work invites comparisons to John Singer Sargent. Mainly, though, there isn’t much tension in the works, mostly because women were not welcome to set up easels in cafes, racetracks, absinthe houses, or brothels. This means their subjects tend to be “safe” ones: themselves, each other, rural genre scenes, society drawing rooms, and women nurturing children. Often, they cross the border from sweet to saccharine. The show’s biggest surprises come when we see something different. Cassatt has long been among my least favorite artists because her endless images of romanticized motherhood make me roll my eyes. But I really liked her self-portrait, which was rendered in looser brushstrokes and rougher finish than her mother-and-child staples. 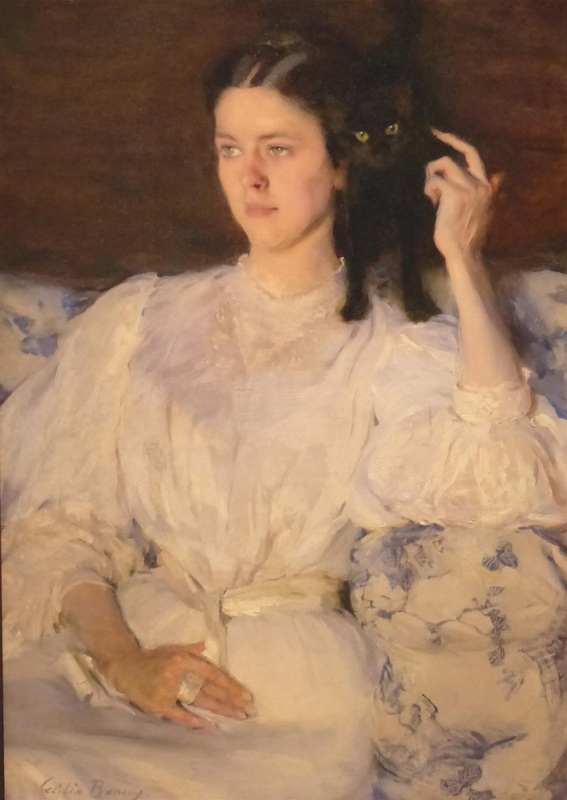 Cassatt, though, is topped by American Elizabeth Nourse, whose inward exudes self-confidence and a hint of insouciance. My takeaway from the exhibit was that the paintings that stood out were those that took tentative steps across the line—and these usually came from Americans and Scandinavians. One exception, though, is Ukrainian Marie Bashkirseff, whose “The Meeting” does indeed capture grit, that of street boys. France’s Amélie Beaury-Saurel’s “Into the Blue” also captivates with a woman casually blowing cigarette smoke into the air as if she couldn’t care less what the observer thinks. 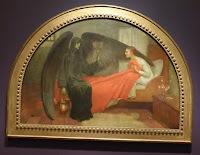 Britain’s Marianne Stokes portrays dark psychological gloom in her “Death and the Maiden,” which evokes the Pre-Raphaelites. My personal favorites were Scandinavian women who seemed willing to unmoor themselves from social expectations. Many of those works fall into the category of symbolism. Norway’s Kitty Kielland captures unsettling light in her “Evening Landscape at Stokkavannet,” and there’s plenty of tension in the works of Finland’s Helene Schjerfbeck. Overall, though, this exhibit tries way too hard to make feminists of bohemians and hangers-on. A more honest engagement with the obstacles female artists faced is in order. A far more interesting look at 19th century can be found in the photographic exhibit City Transformed. 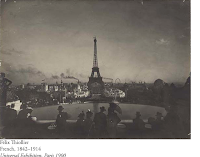 It is a literal snapshot of Paris during the same crucial period between 1850-1900. Those who remember their European history will recall that, in 1852, Bonaparte’s nephew declared the Second Empire and took the name Napoleon III. The Second Empire only lasted until 1870, but that was long enough for Napoleon III to charge George-Eugéne Haussmann with the task of transforming the city of grime into the City of Light. Today’s visitor to Paris sees little of the pre-Haussmann city. He so thoroughly remade the French capitol that in a dazzling 50 years, Paris hosted the world’s fair five times (1855, 1867, 1878, 1889, 1900). In 1889, a new icon arose: the Eiffel Tower. It so stunned the world that planners of Chicago’s 1893 exposition came up with Ferris wheel to rival the tower. As you can see in a photo from 1900, Chicago’s rejoinder was easily co-opted. 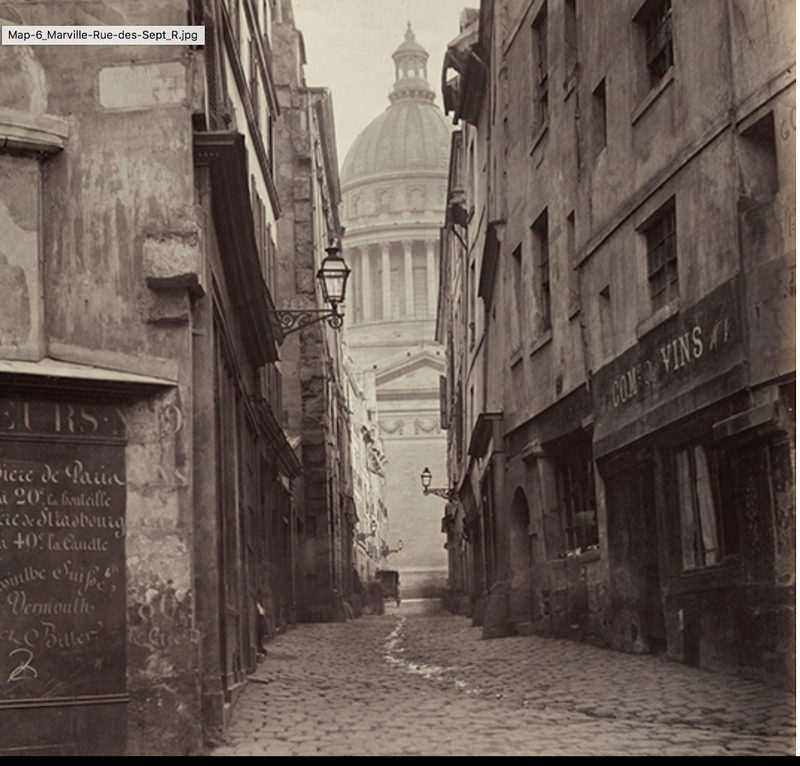 City Transformed gives us peaks at what Haussmann and his successors tore down. Note the center gullies of old cobblestone streets; they used to carry away the “slops” from chamber pots tossed into the streets in hope of timely rains. Featured photographers include Édouard Baldus, Charles Manville, Felix Thiollieer, and Eugène Atget, the last of whom is regarded as one of the masters of the early days of photography. This exhibit embodies the coming social changes of which Women Artists in Paris merely hints. The Art of Iron superbly takes iron mongering out of its normal context, isolates it, and hangs it at a level where we can appreciate it. It samples treasures found in a museum in Rouen, but it spotlights works from the improbably named Jean-Louis Henri LeSeq Destournelles (1818-82) and his son Henri (1854-1925). It used to be that material culture was relegated to anthropological or folk art exhibitions. These days we have come to appreciate the beauty and intricate design that’s often inherent in everyday objects. This exhibit fits nicely with City Transformed, as anyone who has marveled over Parisian street lights or Metro signs knows first hand. It’s also a wonderful mix of craft and whimsy. The Clark’s Stonehill Center currently houses Los Angeles artist Jennifer Steinkamp’s Blind Eye. It is the Clark’s first video installation—six computer-generated projections in which Steinkamp uses the Clark’s natural surroundings. The aim is to create hyper-reality with a 3-D effect. Alas, the impact is a big meh! It’s all pleasant enough, but one wonders about trying to improve upon what the naked eye can observe. Her installation of free-floating blooms is intriguing, but I doubt she was aiming at what it evoked for me: animated scenes from the Hollywood film Avatar. Maybe the Clark ought to leave this sort of thing to Mass MoCA.